Delivery was on time and needed both myself and my partner to put it together and move it into place. Regular gym members may be able to do this on their own, I would still recommend delivery however as the weight of the bike is a hefty 38kg’s in its box. For the sake of a few pounds delivery it was more than worth it. 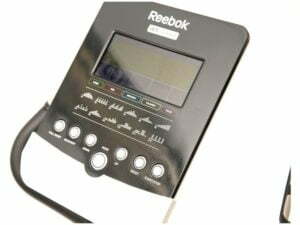 The good news is that unlike some budget bikes Reebok have put some thought into the instruction manual and have a clearly numbered set of instructions. The whole set up process took around 1 hour 15 minutes and only had one slight hiccup with the wrong size screws. It is mains powered and so remember that you will need access to an electrical socket close to the bike. 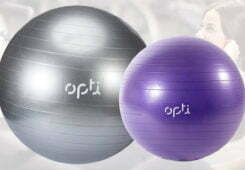 Lastly I adjusted the floor bars to ensure that it was stable on my laminate floor and we were ready to test it out. 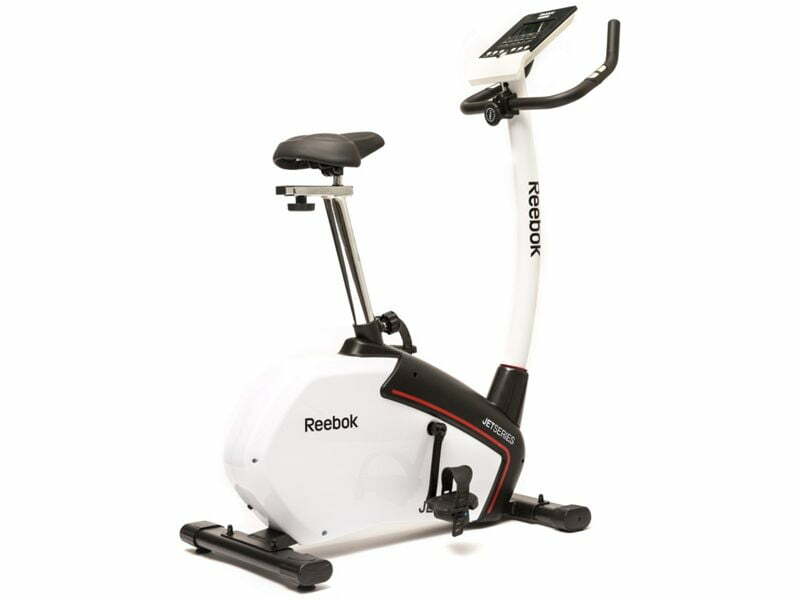 The Reebok Jet 100 exercise bike comes in a really nice colour of white with black and silver trim. 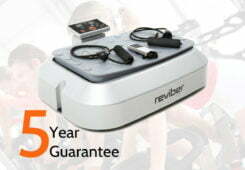 This is just personal opinion but this is one of the better exercise bikes I have had the pleasure to test. 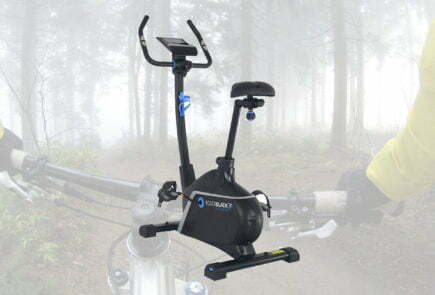 The whole base unit it hidden behind a clan outer shell and it has good quality stability feet along with a great looking neck, LCD unit and handlebars. One of major benefits of the Jet 100 is that is has many adjustable parts to ensure the bike is perfectly matched to the rider. The first is the adjustable handlebars that allow you to choose a comfortable position, which is perfect for me as I am typically shorter than the average user. Next is the adjustable seat, not only in height but also in distance towards or away from the bike, you can really tell that Reebok have taken feedback on board before they built the Jet 100. We measured the seat to be adjustable between 70cm and 100cm which should accommodate the majority of users. 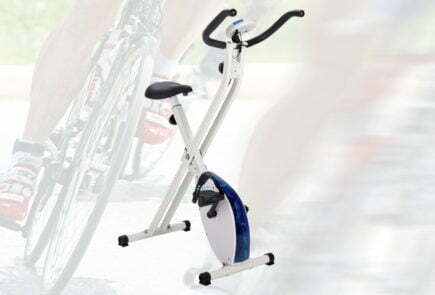 Last is the self-levelling pedals, it’s always the little things that I give extra marks for and not having to do some type of foot dance each time you want to use the bike is one of them. 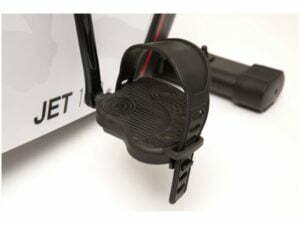 The Jet 100 comes equipped with a high quality padded seat that means that the chances of getting saddle sore for all those who may use the bike frequently shortly after purchase (and you catch the cycling bug). Added to the base unit are transport wheels for easy movement should you want to cycling in front of the TV (while watching X-factor like me) before moving it back into storage. The sign of a higher quality bike is a good quality fly wheel. 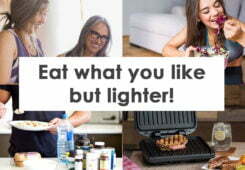 The Jet 100 comes equipped with a 9kg version that gives a much smoother and natural feeling while in use. 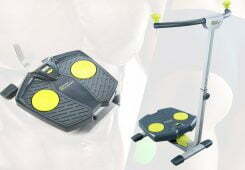 The fly wheel is what is used to create the resistance during your workout. Budget bikes that have lighter and smaller fly wheel give a less consistent ride. 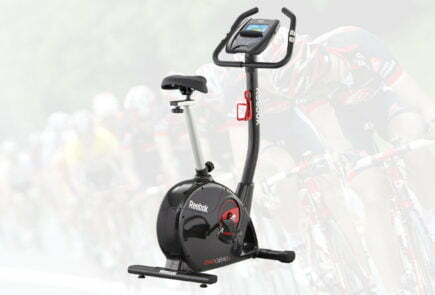 As mentioned above the LCD panel on the Jet 100 bike is almost an exact replica of the Jet 100 cross trainer. 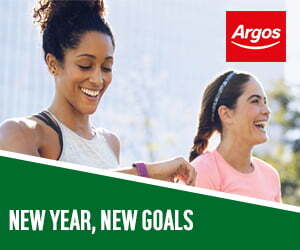 This isn’t a bad point as the layout is clear with easy to navigate programme diagrams surrounding the main display. 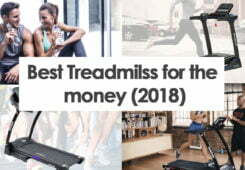 This make choosing the right workout for you much easier than some other bikes that may require you to refer to the supplied instruction booklet. The feedback unit is clear and the numbers are crisp. The main colours of the unit are a blue background with white text. Programme updates and settings are green and on the whole the display is very pleasing on the eye. 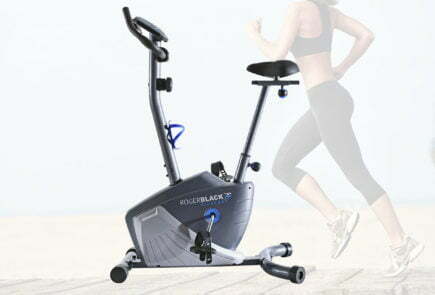 The bike comes with 19 user programmes in total including the 12 pre-sets plus 1 custom user defined and various other target settings. 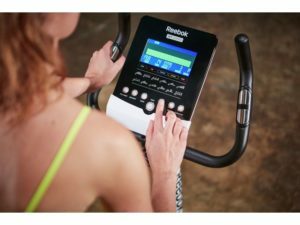 The bike comes complete with hand pulse sensors that are used to calculate heart rate and calories burnt. Other standard settings include the display of time and distance. 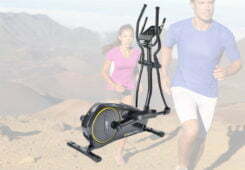 It’s really hard to point out any major negative points of the Jet 100 exercise bike. 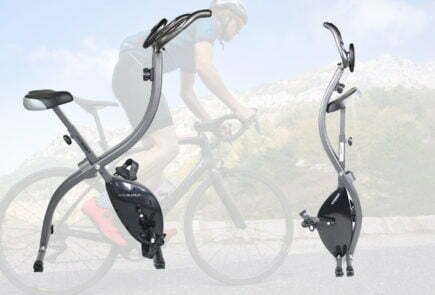 One would be the decision not to include a bottle holder and another is that we have seen better handlebars on similar prices bikes. On the whole only really minor points. From the moment I opened the box it was evident that this was going to be a high quality purchase. 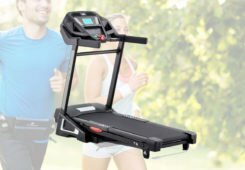 Reebok have not disappointed in matching the same high standards that we have seen with the Jet 100 treadmill and cross trainer. The Jet 100 exercise bike is packed full of features and is adjustable to even the most specific cyclist requirements. 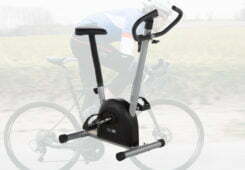 If you can stretch your budget to purchase this bike then you will not be disappointed. 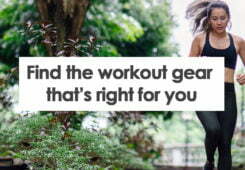 Reebok are even willing to cover your bike with a 2 year warranty for parts and labour. 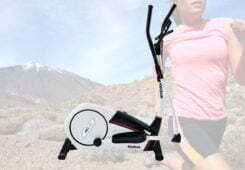 We take a look at Reeboks latest offering with the Jet 100 exercise bike.